Come enjoy the best golf deals in the metro area at the City’s four great courses! 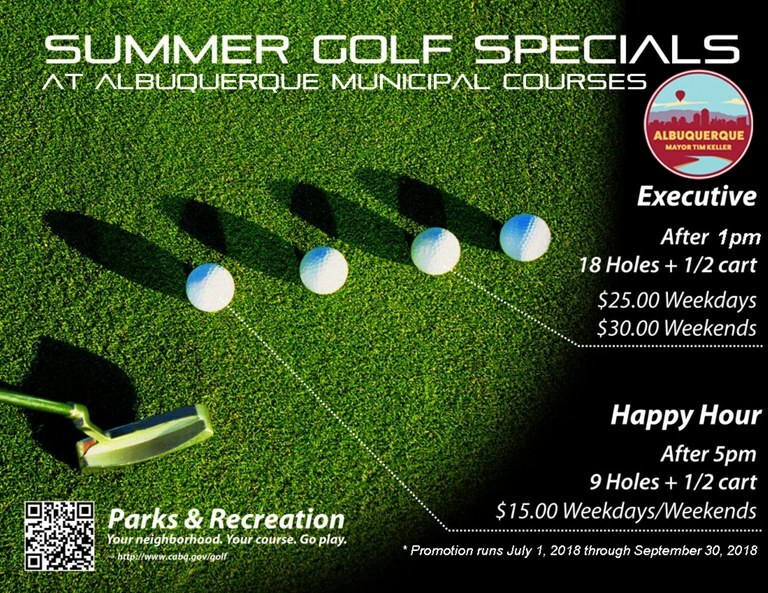 The City of Albuquerque’s Parks and Recreation Department today announced summer closeout discounts at the City’s four golf courses. The promotions include special pricing for afternoon and happy hour rounds in addition to new punch cards that allow golfers to earn free rounds when they pre-purchase a designated number of rounds. Beginning today, all four City golf courses will be offering an Afternoon Special seven days a week. After 1:00 p.m., golfers can get 18 holes and 1/2 cart for $25.00 on weekdays and $30.00 on weekends. Additionally, the City’s courses will be offering a Happy Hour Special, where golfers can get 9 holes and 1/2 cart for $15.00 after 5:00 p.m. every day of the week. These rates will continue through September 30, 2018. Additionally, the City’s golf courses will be selling two different punch cards. Golfers will be able to purchase 10 rounds for the price of 8 rounds or 13 rounds for the price of 10 rounds. These pre-purchased rounds are valid any time and day of the week through December 31, 2018. 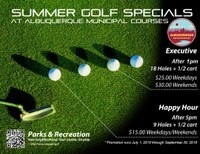 The City of Albuquerque’s golf facilities are open 364 days a year, weather permitting.